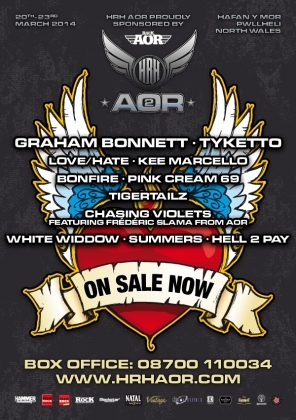 Hard Rock Hell presents AOR 2. Hard Rock Hell presents AOR 2. Graham Bonnet, Tyketto, Kee Marcello & Love/Hate announced for next Spring’s extravaganza. HRH AOR in proud association with Classic Rock Magazine is excited to announce its first round of acts for next year’s spring extravaganza including seminal English rock singer and ex Rainbow, MSG and Alcatraz frontman Graham Bonnet. Joining Graham Bonnet, HRHAOR are also pleased to announce, the appearance of Tyketto who will be celebrating their 25th anniversary at our second edition. This year taking place at Haven Hafan y Môr Holiday Park, Pwllheli, Gwynedd, North Wales on March 20th -23rd. Also on the bill are LA rockers Love/Hate plus we are pleased to announce a one off, not to be missed, performance by ex Europe legendary Guitarist Kee Marcello. Also joining the festivities are German melodic rockers Bonfire who never fail to put on a great show wherever they play and Pink Cream 69, who released their new album ‘Ceremonial’ on Frontiers earlier this year. Other acts also announced are Tigertailz, Chasing Violets featuring Frédéric Slama from AOR, White Widdow, Summers and Hell 2 Pay. More acts will also be announced shortly.